I know it’s not really what any spearer wants to hear, but yesterday was a beautiful day. I spent Saturday traveling along the east shore of Lake Winnebago from Appleton down to Pipe, then headed over to Elkhart Lake to meet Dave Koball of Big K Decoys. I literally stopped at all of the local bars and boat landings, so I have plenty of photos and info that I gathered along the way. Check back for a post later today or early tomorrow on what I saw and learned. As I said, the weather was gorgeous with temps probably in the 40s (judging by the fact that I ditched my winter jacket and just needed a sweatshirt) and the sky was perfectly clear. Of course, this isn’t a good thing with less than a week before sturgeon spearing opens. It looks like we should expect one to two more days of this before the temperature drops, giving the ice a chance to heal a bit before the start of the season. As you’ve heard, the thickness of ice varies heavily across the lake and travel by foot and ATV is recommended only if you know how much ice is under you at all times! Dave shows off the decoy he was using when he speared his first sturgeon in 2009. I met up with Dave yesterday at his home in Elkhart Lake to learn more about his decoys and check out some of his latest projects. Dave began sturgeon spearing in 2009 after years of hanging out in his buddies’ shacks. He decided to purchase his own license after watching one of his friends spear a sturgeon and said the excitement of that moment is what really got him hooked. Well it was a lucky year for him and he speared the largest fish on Lake Winnebago in 2009: a 72″ F2 weighing in at 137 lbs. I saw the mounted fish at his home and let me tell you, this is a BIG fish. You’ll find him on the list of the largest sturgeon speared on Lake Winnebago & the upriver lakes (1941-2011). Dave has a history with the lake sturgeon prior to his first catch and volunteered for the Sturgeon Patrol while studying at UW-Stevens Point. He emphasized his respect for the prehistoric fish and his great appreciation for the DNR’s hard work in successfully bringing back the lake sturgeon population in the Lake Winnebago system. Dave carved a decoy for his first year out on the ice with a little experience from wood-working classes in high school. He got a great response and was told he should start carving decoys for others, too. He taught himself along the way through trial and error and has really come a long way since his very first decoy. He estimated that he has sold over 500 decoys by now and they are quickly growing in popularity around the lake. 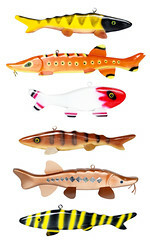 Dave’s decoys come in all sizes, shapes, and colors (see examples below). 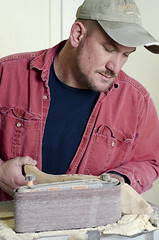 He starts with just about any type of wood–walnut, cedar, birdseye maple, cherry, wood from fence posts or pallets–you name it and Dave can turn it into a decoy. After drawing out a general shape, he carves and sands the wood until he gets a final form that he’s happy with. Each season Dave typically chooses 4-8 fish shapes based on customers’ response, but he also takes special orders. 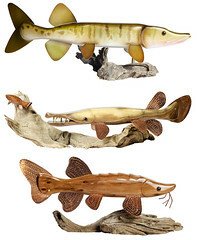 He has carved everything from sturgeon and muskies to blue gills and gar. He then adds laser-cut aluminum or copper fins to each fish and fills the the form with lead for weight in the water (all decoys are balanced in water). Dave air brushes a colorful design or clear polyurethane coat on each fish. Many of Dave’s decoys are intended for use, but he has also started to make more realistic “mounted” or decorative versions as well. Everyone always wants to know how long each decoy takes to create from start to finish, but Dave said he really isn’t sure. He estimates that it takes approximately two or more hours of work per decoy depending on the size and complexity. You’ll find Dave’s decoys for sale at Wendt’s on the Lake (Van Dyne), Quinney Quencher (Chilton), Fishtale Inn (Hilbert), Bobbers (Hilbert), the Express gas station in Pipe, Talk of the Town (Calumetville), Tommy J’s (Johnsburg), Ma’s Bait Shop (Fremont), and Jerry’s Bar (Oshkosh). Prices vary based on style and size. Visit one of these locations to pick up your decoy for this season, or call Dave at 920.946.1522 if you are interested in ordering a custom decoy for the 2013 season–tell him the Winnebago Lake Sturgeon blog sent you! Dave does a lot of his decoy work during the summer months, so it is best to place your order now. He is open to all ideas and is more than happy to receive suggestions! Also, if you’re using one of Dave’s decoys be sure to send him some feedback and a photo of you with your speared sturgeon and decoy–drop him an email at biggrass02@yahoo.com. Thanks Dave for letting me stop by!